St. Paul had humble beginnings. At first, prayer meetings were held in the homes of members. God's response to the need for a location allowed use of school facilities at LaVega ISD for worship. After meeting several challenges, the congregation gathered on September 16, 1956, for their first official service. Known at the time as the Lutheran Church of Bellmead, an overflowing crowd of 137 individuals was ministered to that day! On September 30, 1956, the congregation was officially named St. Paul Lutheran Church in a service of dedication. Sensing its missionary obligations, its great challenges and possible rewards, the church was named after the great missionary, St. Paul. 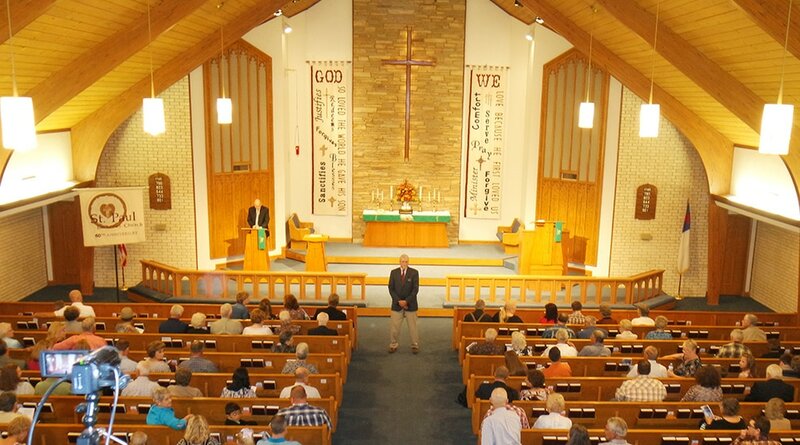 God responded and heard the prayers from His new congregation and by January 1957, just four short months after their official beginning, the church became self-supporting and no longer in need of contributions from other congregations. Truly this beginning was richly blessed by God. This financial stability led St. Paul to an opportunity to acquire thirteen acres on Hogan Lane and Wheeler Avenue. The new church building was dedicated on November 8, 1958. The church had grown at this point to 223 souls and 132 communicant members. In 1971, the congregation pledged to designate the first $100 of every offering to Missions. From that day on, the church at St. Paul has only known God's richest blessings and has grown in all phases of spiritual and physical life. Today, the church's mission remains the same...to spread the love of God to all those in need. Over the past 60+ years, members have encountered many blessings and many challenges. With their faith in God the church continues to thrive. As we face the future with God's grace and guidance, may we continue to grow and nurture one another in His holy name.